Repton Park has a very interesting history, where it was the home for Claybury Asylum. Architecturally, Claybury was one of the best known asylums in late Victorian Britain. Regarded as a model institution, it was designed to house two thousand patients. With its large workforce, this was as big as a small town. 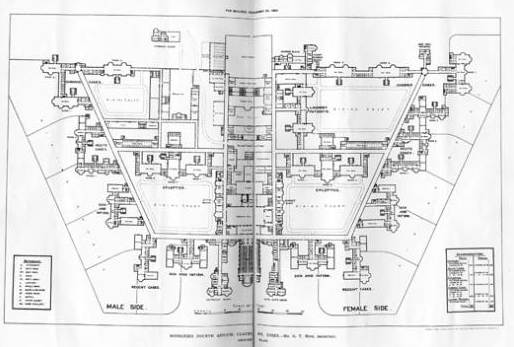 Claybury’s plan was based on the pavilion system, common to hospitals from the mid nineteenth century onwards. Wards were well spaced out, usually two or three storeys high, ensuring plenty of light and fresh air, and to cut down infections. Patients could be kept well apart, and given plenty of space for exercise in the many walled airing courts. This plan, published in The Builder (1889), suggests much about contemporary ideas on mental illness. Patients are divided up by their diagnosis: the sick, acute and chronic. Provision for those suffering with epilepsy seems especially high. Men and women were separated, patients and staff alike. Interestingly, there was more accommodation for female patients: a statistic of the gender injustice of the period? At the asylum’s heart is the chapel: the patients’ relationship with God was still regarded as central to their recovery. If you’re interested in discovering more about Repton Park, its rich history and ultimate designation as a conservation area, simply click on the link below, to read the full report prepared by The London Borough of Redbridge. It is reproduced here with kind thanks from the RPRA committee.